The bare type of T is extracted into value_t. Use this type to store a pointer to a DataSourceBase. Use this type to store a const pointer to a DataSourceBase. Return the data as type T.
Return the result of the last evaluate() function. Get a const reference to the value of this DataSource. Force an evaluation of the DataSourceBase. Return a shallow clone of this DataSource. Create a deep copy of this internal::DataSource, unless it is already cloned. Return useful type info in a human readable format. Return the Orocos type info object. Return the Orocos type name, without const, pointer or reference qualifiers. Returns a const pointer to the sample contained in this data source, if there is any. Decrease the reference count by one and delete this on zero. Reset the data to initial values. Returns true if this object can be cast to an AssignableDataSource. In case the internal::DataSource returns a 'reference' type, call this method to notify it that the data was updated in the course of an invocation of get(). Update the value of this internal::DataSource with the value of an other DataSource. Generate a ActionInterface object which will update this internal::DataSource with the value of another internal::DataSource when execute()'ed. Get a (const) reference data source to a member of the structure of this data source. Same as above, but with run-time lookup of the member to use. Returns the names of all members of the structure contained in this data source, or an empty list if none. Returns the top level data source that contains the full data structure this data source refers to. Stream the contents of this object. Get the contents of this object as a string. Returns a pointer to the sample contained in this data source, if there is any, and if it is an lvalue. Return usefull type info in a human readable format. Return the Orocos type info. This method narrows a base::DataSourceBase to a typeded DataSource, possibly returning a new object. Returns a shared ptr to a DataSourceBase living on the stack. Returns a const shared_ptr to a DataSourceBase living on the stack. We keep the refcount ourselves. DataSource is a base class representing a generic way to read data of type T.
T The type of data returned. Definition at line 94 of file DataSource.hpp. This method returns a duplicate of this instance which re-uses the DataSources this internal::DataSource holds reference to. The clone() function is thus a non-deep copy. Implemented in RTT::internal::NArityDataSource< function >, RTT::internal::UnaryDataSource< function >, RTT::internal::BinaryDataSource< function >, RTT::internal::ActionAliasAssignableDataSource< T >, RTT::internal::ActionAliasDataSource< T >, RTT::internal::LateConstReferenceDataSource< T >, RTT::internal::LateConstReferenceDataSource< A >, RTT::internal::FusedMCollectDataSource< Signature >, RTT::internal::LateReferenceDataSource< T >, RTT::internal::LateReferenceDataSource< ds_type >, RTT::internal::ArrayDataSource< T >, RTT::internal::FusedMSendDataSource< Signature >, RTT::internal::FusedMCallDataSource< Signature >, RTT::internal::AliasDataSource< T >, RTT::internal::ReferenceDataSource< T >, RTT::internal::ReferenceDataSource< ds_type >, RTT::internal::AssignableDataSource< T >, RTT::internal::AssignableDataSource< ProgramInterfacePtr >, RTT::internal::AssignableDataSource< DataSourceType >, RTT::internal::AssignableDataSource< types::carray< T > >, RTT::internal::AssignableDataSource< remove_cr< boost::function_traits< Signature >::result_type >::type >, RTT::internal::AssignableDataSource< ds_type >, RTT::internal::AssignableDataSource< value_t >, RTT::internal::AssignableDataSource< ProgramInterface * >, RTT::internal::AssignableDataSource< bool >, RTT::internal::AssignableDataSource< StateMachinePtr >, RTT::corba::ValueDataSourceProxy< T >, RTT::internal::ConstReferenceDataSource< T >, RTT::internal::PartDataSource< types::carray< T > >, RTT::internal::ConstantDataSource< T >, RTT::internal::ArrayPartDataSource< T >, RTT::internal::FusedFunctorDataSource< Signature, Enable >, RTT::corba::DataSourceProxy< T >, RTT::internal::PartDataSource< T >, RTT::internal::InputPortSource< T >, RTT::internal::ValueDataSource< T >, RTT::internal::ValueDataSource< ProgramInterfacePtr >, RTT::internal::ValueDataSource< ds_type >, RTT::internal::ValueDataSource< StateMachinePtr >, RTT::corba::AnyDataSource, RTT::scripting::DataSourceTime, RTT::internal::DataSourceCommand, RTT::scripting::DataSourceCondition, and RTT::internal::DataObjectDataSource< T >. Places the association (parent, clone) in alreadyCloned. If the internal::DataSource is non-copyable (for example it represents the Property of a Task ), this may be returned. Referenced by RTT::scripting::ConditionBoolDataSource::copy(), RTT::scripting::ConditionDSDuration::copy(), RTT::scripting::CommandDataSourceBool::copy(), RTT::scripting::TryCommandResult::copy(), RTT::internal::ArrayPartDataSource< T >::copy(), RTT::scripting::EvalCommand::copy(), RTT::scripting::EvalCommandResult::copy(), RTT::internal::BinaryDataSource< function >::copy(), and RTT::internal::UnaryDataSource< function >::copy(). Reimplemented in RTT::internal::ActionAliasAssignableDataSource< T >, RTT::internal::ActionAliasDataSource< T >, RTT::internal::AliasDataSource< T >, RTT::internal::FusedMCallDataSource< Signature >, RTT::internal::FusedFunctorDataSource< Signature, Enable >, RTT::internal::InputPortSource< T >, and RTT::internal::DataObjectDataSource< T >. Definition at line 52 of file DataSource.inl. Referenced by RTT::Property< bool >::Property(), RTT::scripting::CommandDataSourceBool::readArguments(), RTT::scripting::EvalCommand::readArguments(), RTT::internal::ReferenceDataSource< ds_type >::setReference(), and RTT::internal::AssignableDataSource< T >::update(). You must call getMember() in turn on the returned member to access sub-members. member_name The name of the member to get access to. null if the member does not exist, this if member_name.empty(), and a reference data source to the member otherwise. Definition at line 124 of file DataSource.cpp. Also takes an optional offset argument which can be used to offset the member in memory. This is necessary when using sequences of sequences. DataSources which are a sequence/offset member themselves must override this function to let the returned member take the offset into account. Definition at line 130 of file DataSource.cpp. If this data source is a sequence, it will not return the allowed index numbers. Definition at line 134 of file DataSource.cpp. Definition at line 138 of file DataSource.cpp. Definition at line 59 of file DataSource.inl. 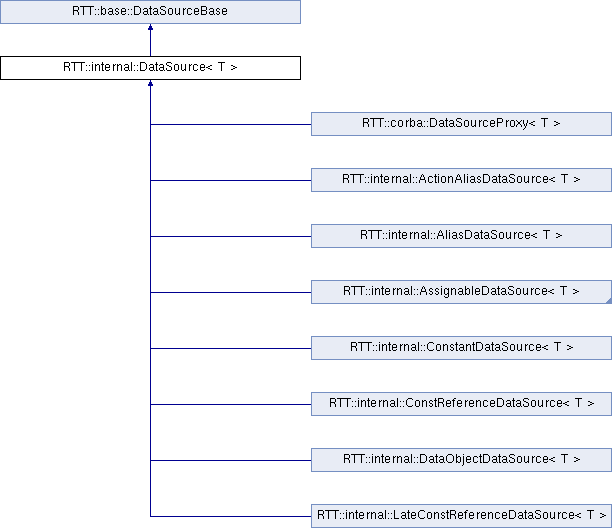 Reimplemented in RTT::internal::AssignableDataSource< T >, RTT::internal::AssignableDataSource< ProgramInterfacePtr >, RTT::internal::AssignableDataSource< DataSourceType >, RTT::internal::AssignableDataSource< types::carray< T > >, RTT::internal::AssignableDataSource< remove_cr< boost::function_traits< Signature >::result_type >::type >, RTT::internal::AssignableDataSource< ds_type >, RTT::internal::AssignableDataSource< value_t >, RTT::internal::AssignableDataSource< ProgramInterface * >, RTT::internal::AssignableDataSource< bool >, and RTT::internal::AssignableDataSource< StateMachinePtr >. Definition at line 115 of file DataSource.cpp. When this method returns true, all update functions below will return as well when valid input is given. Definition at line 104 of file DataSource.cpp. You must call evaluate() prior to calling this function in order to get the most recent value of this attribute. Getting a reference to an internal data structure is not thread-safe. Implemented in RTT::internal::NArityDataSource< function >, RTT::internal::UnaryDataSource< function >, RTT::internal::BinaryDataSource< function >, RTT::internal::ActionAliasAssignableDataSource< T >, RTT::internal::ActionAliasDataSource< T >, RTT::internal::LateConstReferenceDataSource< T >, RTT::internal::LateConstReferenceDataSource< A >, RTT::internal::LateReferenceDataSource< T >, RTT::internal::LateReferenceDataSource< ds_type >, RTT::internal::FusedMCollectDataSource< Signature >, RTT::internal::ArrayDataSource< T >, RTT::internal::FusedMSendDataSource< Signature >, RTT::internal::AliasDataSource< T >, RTT::internal::FusedMCallDataSource< Signature >, RTT::internal::ReferenceDataSource< T >, RTT::internal::ReferenceDataSource< ds_type >, RTT::internal::ConstReferenceDataSource< T >, RTT::internal::PartDataSource< types::carray< T > >, RTT::corba::ValueDataSourceProxy< T >, RTT::internal::ConstantDataSource< T >, RTT::internal::ArrayPartDataSource< T >, RTT::internal::FusedFunctorDataSource< Signature, Enable >, RTT::internal::PartDataSource< T >, RTT::corba::DataSourceProxy< T >, RTT::internal::ValueDataSource< T >, RTT::internal::ValueDataSource< ProgramInterfacePtr >, RTT::internal::ValueDataSource< ds_type >, RTT::internal::ValueDataSource< StateMachinePtr >, RTT::internal::InputPortSource< T >, RTT::corba::AnyDataSource, RTT::scripting::DataSourceTime, RTT::internal::DataSourceCommand, RTT::scripting::DataSourceCondition, and RTT::internal::DataObjectDataSource< T >. Referenced by RTT::types::StdVectorTypeInfo::composeType(), RTT::types::BoostArrayTypeInfo< T, has_ostream >::composeType(), RTT::types::SequenceTypeInfoBase< std::vector< double > >::composeType(), RTT::types::CArrayTypeInfo< T, has_ostream >::composeType(), RTT::types::decomposePropertyBag(), RTT::corba::ValueDataSourceProxy< T >::get(), RTT::internal::DataSource< first_arg_t >::getRawConstPointer(), RTT::corba::ValueDataSourceProxy< T >::rvalue(), RTT::Property< bool >::rvalue(), RTT::types::typeDecomposition(), RTT::corba::ValueDataSourceProxy< T >::value(), and RTT::OutputPort< T >::write(). Make sure that the const_ptr does not outlive the stacked element. Definition at line 74 of file DataSource.cpp. Make sure that the shared_ptr does not outlive the stacked element. Definition at line 69 of file DataSource.cpp. Definition at line 98 of file DataSource.cpp. Update does a full update of the value, adding extra information if necessary. false if the DataSources are of different type OR if the contents of this internal::DataSource can not be updated. Definition at line 108 of file DataSource.cpp. zero if the internal::DataSource types do not match OR if the contents of this internal::DataSource can not be updated. Definition at line 120 of file DataSource.cpp. Implemented in RTT::internal::NArityDataSource< function >, RTT::internal::UnaryDataSource< function >, RTT::internal::BinaryDataSource< function >, RTT::internal::ActionAliasAssignableDataSource< T >, RTT::internal::ActionAliasDataSource< T >, RTT::internal::LateConstReferenceDataSource< T >, RTT::internal::LateConstReferenceDataSource< A >, RTT::internal::FusedMCollectDataSource< Signature >, RTT::internal::LateReferenceDataSource< T >, RTT::internal::LateReferenceDataSource< ds_type >, RTT::internal::ArrayDataSource< T >, RTT::internal::FusedMSendDataSource< Signature >, RTT::internal::AliasDataSource< T >, RTT::internal::FusedMCallDataSource< Signature >, RTT::internal::ReferenceDataSource< T >, RTT::internal::ReferenceDataSource< ds_type >, RTT::internal::ConstReferenceDataSource< T >, RTT::internal::PartDataSource< types::carray< T > >, RTT::corba::ValueDataSourceProxy< T >, RTT::internal::ConstantDataSource< T >, RTT::internal::FusedFunctorDataSource< Signature, Enable >, RTT::corba::DataSourceProxy< T >, RTT::internal::ArrayPartDataSource< T >, RTT::internal::PartDataSource< T >, RTT::internal::InputPortSource< T >, RTT::internal::ValueDataSource< T >, RTT::internal::ValueDataSource< ProgramInterfacePtr >, RTT::internal::ValueDataSource< ds_type >, RTT::internal::ValueDataSource< StateMachinePtr >, RTT::corba::AnyDataSource, RTT::internal::DataSourceCommand, RTT::scripting::DataSourceCondition, RTT::scripting::DataSourceTime, and RTT::internal::DataObjectDataSource< T >. Referenced by RTT::scripting::CommandDataSourceBool::execute(), RTT::scripting::EvalCommand::execute(), RTT::internal::AssignableDataSource< T >::update(), and RTT::corba::ValueDataSourceProxy< T >::updated(). Definition at line 91 of file DataSource.cpp. Definition at line 88 of file DataSourceBase.hpp. Referenced by RTT::base::DataSourceBase::deref(), and RTT::base::DataSourceBase::ref().